There's still time to make yourself a mug of cocoa, stick a candy cane in it, and indulge in a festive Christmas read with a kitty (or three!) on your lap. We've been doing a lot of that lately and wanted to tell you about some of our favorites! 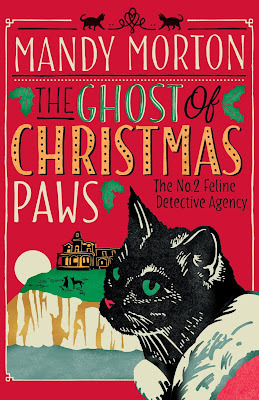 This isn't only my favorite Christmas book of the year, it's going on my list of favorite cat cozies of all time. Over the past year I've fallen in love with Hettie Bagshot and her sidekick Tilly as they live their cozy little lives in a back room apartment of a bakery. In this fourth book of the series the ladycats are summoned to the Cornish coast by Lady Eloise Crabstock-Singe to solve the mystery of Christmas Paws, a servant cat who haunts the Manor intent on killing off all the Crabstocks, and Lady Eloise is the only one left. With their hometown gripped by the cat flu, Hettie and Tilly decide to make the dangerous trek facing blizzards and more than a few suspicious characters, and in the gripping final pages there's a twist I never saw coming but is simply brilliant. Fans of Daphne du Maurier will notice her influence all through this charming Christmas cozy, which will be reread in my home for many years to come! Everyone at Molly's, the Cotswolds only cat cafe, is getting in the Christmas spirit: resident cat Molly and her kittens and their adoring owner Debbie. Then Debbie's sister Linda shows up unexpectedly having left her husband, and Debbie invites her to stay not knowing their perfect lives are about to be seriously upended. Not only does Linda have a dog, she also decides to make all sorts of changes to their cozy cafe including introducing a hoity-toity Siamese to the mix who Linda believes should be the new "face" of the cat cafe. Things go from bad to worse when Molly's worries about the future end up driving a wedge between her and the ones she loves. Written entirely from the charming voice of Molly, this is a heartwarming Christmas story focusing on family, forgiveness, friendship, food...and some pretty unforgettable cats. 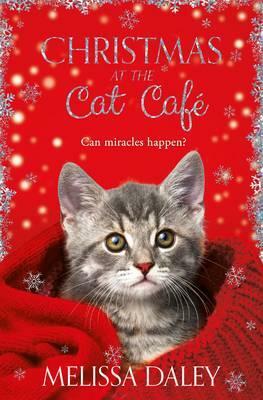 The only thing better than visiting a cat cafe is having the opportunity to visit one at Christmas, and this book allows readers to do just that. With the fireplace crackling, the tree twinkling, and the carols humming, few things in life are as picture perfect as Christmas in Maine—until murder dampens the holiday spirit. It must be something in the eggnog . . .The theme of this cozy mystery anthology really made me chuckle because one of the very few foods I just can't stomach is eggnog. All three of these stories are set in Maine (the quintessential place to celebrate Christmas) and feature beloved characters from some of our favorite long-running cozy series at Kensington Publishing. 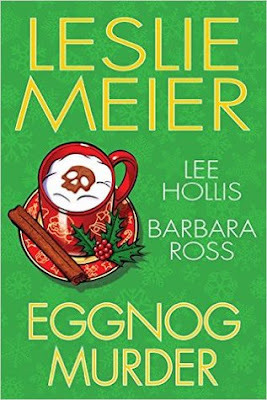 In "Eggnog Murder by Leslie Meier, Lucy Stone must figure out who tainted the eggnog served at the town's annual holiday stroll, while also dealing with her adult children back under the same roof and writing a story for the newspaper about an Operation Desert Storm veteran who recently passed away after seemingly being forgotten by the system. In "Death by Eggnog" by Lee Hollis, the Scroogy town librarian Agatha Farnsworth dies after dying of an allergic reaction to supposedly non-dairy eggnog. Hayley has her work cut out for her since the victim left no shortage of people who'd like to see her dead. This was my favorite story in the collection. And in Barbara Ross's "Nogged Off" Julia goes back to NYC to clear out her apartment only to find the girl sub-leasing it in a total life crisis: she left her job after landing all her co-workers in the emergency room thanks to homemade eggnog and then breaks up with her boyfriend. Julia ends up taking Imogens home to Busman's Harbor for a New England Christmas and everything goes wrong from that point on. Their rental truck is stolen, Imogens boyfriend is found dead in the back when it's located, and Julia starts to wonder what kind of people she's brought to her family home. It's just days before Christmas and Delaney's boss at The Cracked Spine in the heart of Edinburgh has brought her a box of items that was left anonymously at his house which he fears were stolen. Among the various odds and ends are a worn copy of A Christmas Carol with an old photo tucked inside. A name on the back of the picture leads Delaney to the flat of an old woman whose granddaughter has gone missing. The twists that follow are unbelievable yet poignant and filled with the magic of Christmas. Fans of historical mystery and the paranormal will enjoy this just as much as cozy readers. Those sound terrific, especially the Hettie Bagshot book (love that series!) and A Christmas Tartan. These all sound so fantastic and festive! I am so glad you shared these, as I am currently finishing up none other than A Christmas Carol, and have been looking for another Christmas story to read afterwards. Now I have some perfect (and purrfect) reads to choose from! Wow, that is high praise for The Ghost of Christmas Paws. I will definitely have to check out this series. Very nice post. Thank you for sharing with us all those great books suggestions for the holidays!!! 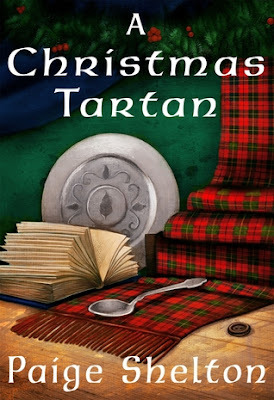 Going to start with A Christmas Tartan. Fun post, they all look good! 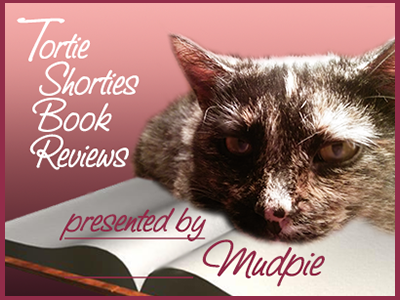 I recently read Cheddar Off Dead (shh, there's a big dog in it!) that was a really good second book in a cozy series by Julia Buckley. The first 2 really caught my interest. The only Christmas one I read was Oliver, the Cat Who Saved Christmas, but you already read that one. These would make purrfect gifts for humans. We want mommy to read the cat cafe book to us. The first book looks interesting.